n preparation for building a flying copy of the 1905 Wright Flyer III, we took a trip to the Wright Brothers Aviation Center at Carillon Historic Park in Dayton, Ohio to inspect the real McCoy -- the original 1905 aircraft, restored. The aircraft is displayed in a specially designed building, Wright Hall. As you walk in, it's slightly below you in a huge well or "pit." The curatorial staff, Mary Mathews and Jean Palarmo, kindly let us into the pit to take close-up photos. This was no small favor, since this aircraft has been dubbed a national treasure by an act of Congress. It's also the only aircraft to be designated as a National Historic Landmark. It is indeed a treasure. Charles Gibbs-Smith, a prominent aviation historian, dubbed this restored airplane the most valuable aviation artifact anywhere because it was the first practical airplane, capable of taking off under its own power, navigating to a pre-determined location, and -- as Wilbur Wright so succinctly put it -- "landing without wrecking." This treasure was almost lost to us. The Wrights last flew it in 1908 at Kitty Hawk making the world's first passenger flights. But Wilbur had difficulty with the unfamiliar controls and wrecked the airplane, so the Wrights abandoned it in their shed. It remained there until 1914 when Zenas Crane obtained Orville's permission to salvage it for the Berkshire Museum in Pittsfield, MS. The Berkshire Museum, however, never touched the wreck and it remained in storage until 1946 when Edward Deeds began building Carillon Historic Park. 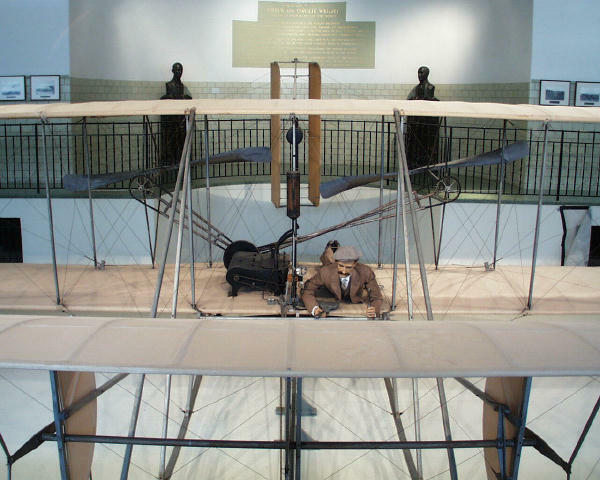 Deeds asked Orville for an airplane; Orville asked the Berkshire Museum to return the Flyer. Harvey P. Geyer, who had once worked for the Wright Company and himself an accomplished inventor, headed the restoration under the supervision of Orville Wright. Louis P. Christman worked with Orville on the engineering drawings. The restored aircraft was unveiled in 1950. It had been "lying in state" for half a century when we were allowed into the pit. For us, this was a marvelous opportunity to get nose to nose with the craftsmanship of the Wright brothers, marvel at their attention to detail, and explore their innovative, no-nonsense approach to engineering. We thought you might like to the share this adventure, so here, with many thanks to Carillon Historic Park, is a photographic walk-around of the original 1905 Wright Flyer III. Let's begin with a walk around the "Pit" in Wright Hall, where the 1905 Flyer III is displayed. This is the scene that greets you as you enter from the east. Move to your right and follow the walkway that runs around the pit. The Flyer rests on a section of the launch rail. The most distinctive feature of this airplane is the prominent forward elevator or "canard" out ahead of the wings. This is almost as large as the the Wrights' first man-carrying glider. Here's the Flyer as it appears head-on. At the back of the hall, you can see the bronze busts of Wilbur and Orville Wright. Continuing around, here's a diagonal view from the front left. The large green wooden box in front of the left wing is the Wrights' tool chest. They kept this at Huffman Prairie when they were developing the Flyer, and it may have also traveled with them to and from Kitty Hawk. A little further on, here's an overview of the Flyer from the back left. You get a real sense of just how big this aircraft is -- 40 feet from wing tip to wing tip and 27 feet from nose to tail. A close-up view of the Flyer's cockpit from behind and to the left. The Flyer III was the last Wright aircraft on which the brothers lay prone to fly it. Note that the tubes that enclose the drive chain on the left side are crossed. The propellers rotate in opposite directions. Another view of the chain tubes at the rear of the Flyer. The Wright made the propellers contra-rotate so the centrifugal and coriolis forces generated by the props would cancel each other out and not pull the aircraft to one side. As we walk down the stairs that lead from the walkway into the pit, our perspective changes. Now the aircraft isn't just big; it's over 8 feet tall. Looking down the length of the wing from the left. This what the brothers or their mechanic Charley Taylor must have seen running along at the wing tip as the Flyer launched. A view of a strut fitting, joining the lower wing to a vertical strut. These were in fact hinges that allowed the wings to move when the pilot warped them. Closer still to the strut fitting. Note how the Wrights "safety wired" the flitting so the strut and the rigging would not slip off. Most of these fitting are simply screwed to the wing spars. A very few are attached with bolts that go through the spars. The wing covering is applied on the "bias" -- the threads run diagonally across the ribs. Each thread becomes a tiny brace, greatly increasing the strength of the wings.. The post and braces that attach the skids to the Flyer are fitted and screwed to the wings. The skids themselves are split at the front of the aircraft, then joined with this U-shaped fitting. This allowed the Wrights to easily detach the front skid assemblies when they stored the Flyer. Beneath the wings, the skids rest on a wheeled carriage or "truck." This truck carries the aircraft as it rolls down the launch rail, but is left behind when the Flyer takes off..
A closer view of the wheeled truck and the launch rail. Just in front of the wings, a brace runs from the leading edge of the lower wing and joins the skid just as it begins to curve upwards. Following the curved portion of the skid forward, another diagonal brace joins it midway. Just forward of this brace, a horizontal tie bar joins the left and right skids. This tie bar mounts a roller that rides the rail during a launch, keeping the Flyer pointed forward. This roller is actually an old bicycle wheel hub. The bottom portion of the elevator support post is curved and fitted to the skid. Another diagonal brace, running from the leading edge of the top wing, joins the skid and the post. Another view of the juncture between the skid, front brace, and elevator support post. A small horizontal tie bar joints the posts. A view of the elevator and the mechanism that adjusts the angle of the top and bottom control surfaces. The semi-circular air foils, called "blinkers" by the Wright brothers, help to stabilize the Flyer in a turn. The chains and wires lead to the elevator control in the cockpit. Moving this control rotates the dumbbell-shaped casting and the horizontal shaft to which it is attached. As the shaft rotates, it cause three horizontal control arms -- one at each end and one in the middle of the shaft -- to rotate as well. Each end of each control arm is a double pivot that attaches the arm to to vertical actuators running to the top and bottom control surfaces. Each actuator arm is attached to a control surface at the leading or trailing edge with another pivot. As the pilot moves the elevator control , this motion is transferred through the wires, dumbbell, shaft, and arms to the control surfaces, changing their angle up or down. You can't see the hardware because it is covered in cloth, but each elevator control surface is hinged in the middle. As the surface moves changes its angle, it also changes camber, curving up or down. Like the biplane wings, the biplane elevator is rigged with wires running diagonally to create a strong truss. Although the elevator surfaces can pivot, changing angle and camber, the assembly is rigid from side to side. The pilot, engine, and drive train occupy four "bays" in the center of the aircraft. (A bay is a space between two struts.) These four bays are completely rigid, the wings don't warp in this area. The cockpit bay includes the pilot, manual controls for roll, pitch and yaw, and a rudimentary set of flight instruments. The engine bay is just to the right of the pilot. The red hot combustion chambers are just 11 inches from the pilot's right side. The engine has four cylinders, make-and-break ignition (no spark plugs), and develops 25 horsepower. The small chain in front runs a camshaft, opening and closing the exhaust valves. The Richard Anemometer attached to the front center strut serves as a flight recorder, recording the time aloft and distance flown through the air. Once the aircraft has landed, the pilot pulls on the lever to his right, stopping the wind vanes and stopwatch incorporated into the anemometer. That same action (pulling the lever) closes the valve that feeds gas to the engine, stopping it. The pilot can also push down on a lever that opens all the exhaust valves. This too will stop the engine by releasing the compression. Just above the anemometer is the gas tank. The Wrights carried enough gasoline to fly for a little over half an hour. Near the top of the center strut is the reservoir for the radiator. There is no radiator cap; the steam is allowed to escape without building up pressure. Just to the right of the center strut, mounted to the bottom wing, is the release latch. A cable was hooked to this latch that restrained the Flyer and kept it from rolling forward. When it was time to take off, the pilot reached down and pulled forward on the metal latch. The latch arm pivoted backwards, the cable dropped, and the Flyer began its take-off roll. At the pilot's right is a horizontal lever that controls the rudder and yaws the Flyer right and left. To his left is a vertical lever that controls the elevator, pitching the nose up and down. The elevator control lever is mounted to a horizontal shaft which turns a pulley. The wires from the elevator (mentioned above) are attached to this pulley. The pilot's hips rest in a hip cradle. This is the roll control. As the pilot moves his hips right and left, the cradle pulls on wires that warp the wings. The pilot's legs stretch back under the drive train. The chain drive stretches out from the engine in two directions to the right and left propeller drive shafts. The pilot's feet are positioned in a footrest that is attached to the rear spar. Moving around to the back of the Flyer, this wide angle shot shows the portion of the wing that warps when the pilot moves the hip cradle. The strut fitting for the rear strut nearest to the left wingtip. The wire attached to it is a control wire, not structural rigging. The trailing edge is wire that runs from rib to rib. You can't see it because it is covered with cloth, but it fits in the notches at the rib ends. Note the seam that joins wing sections. Just inside the seam is the lower control pulley. The control wires are separated at this point and joined with a chain. The same is true of the upper control pulley and wires. The Wrights couldn't run a solid wire over a pulley; it would fatigue and break. So they used bicycle chain at each pulley. Another view of the footrest. The pilot's toes should be hooked under the bar and each shoe tight against the side boards. This provided an anchor for the pilot when he moved his hips right and left. Just over the pilot's legs, you can see the four combustion chambers on the left side of the engine. These ran exceedingy hot. Looking forward, note how the pilot had to arch his back and hold his head up to fly. This created enormous physical strain during long flights. When the engine of the Flyer III was built in 1904, it produced just 16 horsepower. But the Wrights continued to tweak it until by September 1905, it was producing 24. The engine ran at about 1300 rpm. The small gears on the crankshaft and the large gears on the propeller shafts reduced this so the props turned at just 450 rpm. The note on the wooden mount for the magneto says "Found near Kill Devil Hills Aug 6 '08. This part and many others were recovered from souvenir hunters on the Outerbanks. The supporting structure of the drive train consisted of dozens of metal tubes. As bicycle manufacturers, this was something with which the Wrights were very familiar. Each propeller is screwed to a flange on the trailing end of its shaft, then drawn tight with a large nut. The threads are cut so the nut tightens as the prop turns. This prevents the prop from working loose. Note the homemade turnbuckles on the bracing wires that hold the prop shafts in alignment. Of all the hundreds of wires on this aircraft, this is the only place the Wrights thought to adjust the tension. The Flyer III was the first to have the Wrights' trademark "bent-end" props. This unique profile kept the props from distorting and flattening during flight. The Wrights were the first to guess that props were in fact whirling wings, Consequently, prop blades are curved -- they have a camber just like aircraft wings. Two long outriggers attached to the rear spars support the rudder. These outriggers are hinged so that if the rudder strikes the ground, they pivot upwards. (Left) The rudder looks like a large box-kite with two control surfaces spaced about 18 inches apart. (Above) It rests on the trailing end of the bottom outrigger. The rudder pivots on the outriggers. As the pilot moves the rudder control lever in the cockpit right or left, the rudder moves accordingly. The rudder control surfaces are mounted to a pivot board, positioned closer to the leading edge than the trailing edge. This arrangement makes the rudder tend to straighten itself in the air stream. The top of the rudder is similar to the bottom, with a pivot board holding the rudder surfaces. However, the top pivot comes down from the top rather than up through the bottom of the board. The framework of the rudder is not glued. Instead, the tension of the cloth the covers it keeps the wooden pieces together. This metal tab at the trailing edge keeps the two adjoining pieces in alignment. The rudder is rigged with diagonal bracing wires like the wings and the elevator. The Wrights used this same truss system throughout the airframe because it was both light and strong. A look up the centerline of the Flyer, through the rudder to the wings and elevator. Here's something you're not likely to see in a visit to Wright Hall -- the inside of the Wright tool chest. The writing on the inside of the lid says, "This came for Orville Wright's lab. I.W.M. The initials stand for Ivonette Wright Miller, Orville's niece. The chest has five sliding drawers inside, arranged so a workman has access to the entire contents of the chest without having to remove a drawer. Here the two top drawers are spread apart, revealing one of the drawers on the middle level. With the two top and the two middle drawers pushed toward the front of the chest, you can see single deep drawer at the bottom. And here are the two top, two middle, and single bottom drawer all slid towards the back of the tool chest, revealing a deep "well" where large tools can be stored. 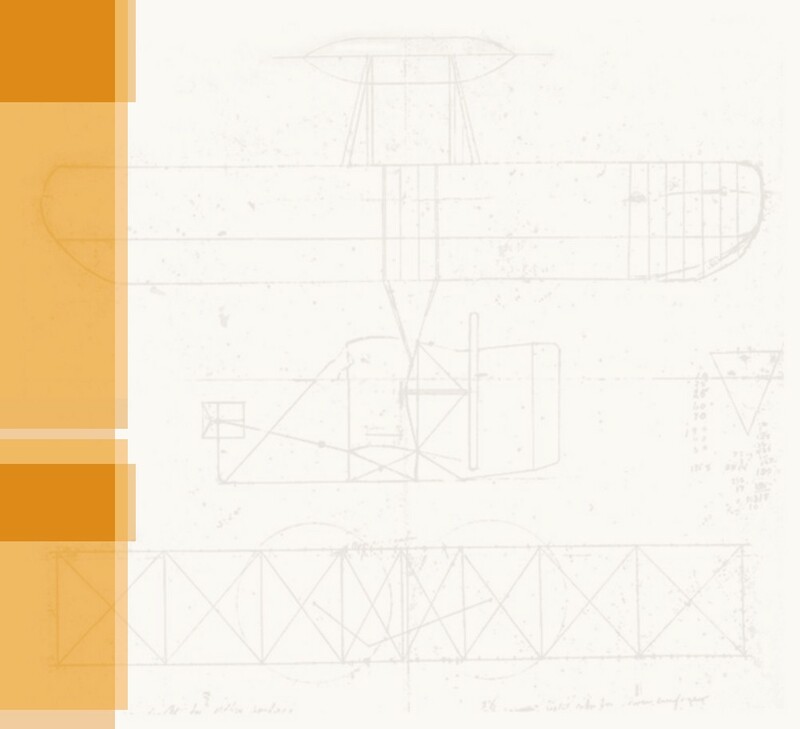 The Restoration, Preservation, and Conservation of the 1905 Wright Flyer III by Jeanne Palermo. The head curator at Carillon Historic Park describes how the Flyer III was rescued and restored, and how it is being cared for today.